Koh-I-Noor Rapidograph Refillable Liquid-Ink Plotter Pens are designed for the highest quality, longest lasting, most flexible, accurate, cost effective pen system. The Plotting System consists of 3 parts: nib, pen body/adaptor, and plotter ink. 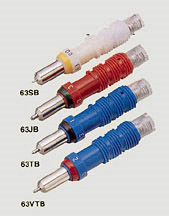 The nib features a 4mm, metal bushing designed to provide maximum concentricity for repeatable positioning. Koh-I-Noor offers four different point tip matertials (avalible in up to 10 precision line widths) to achieve optimum plotting results. Primary media: Drafting film, and Vellum. Other Media: Use 63SB on bond paper and chart paper. (for overhead transparencies use 63VTB only). Operating Conditions: Pen down force; 10 grams at plotting speeds of 30 cm/sec. for 63SB/63TB and 60 cm/sec. for 63VTB Hard chrome stainlss steel tip for plotting speeds up to 30 cm/sec. Designed for useon tracing paper as well as bond and chart papers.